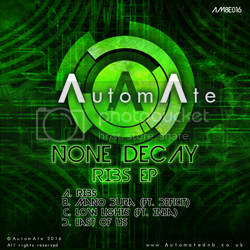 HIJACK > Food for your Ears > Hijackers' Tunes and Mixes > Ribs EP from None Decay - Out Now on AutomAte! Involved with electronic music since the mid 90s, Cambridge duo None Decay have behind them a rich tapestry of studio and DJ experience in drum & bass, hip-hop and beyond. They made their AutomAte debut on Depth of Vision EP Vol.2. Rising quickly through the ranks, their first full-length artist EP on the imprint garnered attention from high-ranking drum & bass officials such as Goldie and Ulterior Motive. This, their second solo artist EP for AutomAte, is a diverse quiver of vibes. Opening track Ribs sets the scene with a relaxed, classic break, warm sub and floating, spacious synth. Next comes Mano Dura, on which label boss Deficit’s tightly-coiled, ever-switching drums are combined with a trademark None Decay alien bassline to form a tough, aggressive weapon aimed at the harder floors. Next up, Low Lights truly embodies the None Decay spirit – laid back, slightly tongue-in-cheek but nonetheless perfectly executed with accomplished delegate of lyrical culture Inja effortlessly delivering the goods on the mic. Finally, things take a turn toward the shadows with the dark, grumpy Last Of Us.